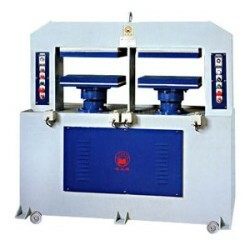 Manufacturer of Shoes Industry Machinery and Equipments. 1. This m/c is adopted rapid cooling forming pattern and the production tate is more over than one multiple for conventional type, especially the forming products will be accurately, beauty and not deformed easily. 2. There is a cooling system be installed in machine frame which will be changed traditional cooling unit must be installed cooling tower & piping etc., equipment, Since, those will be labour saving & others consumption. 3. The mouldings position can convenience & simple of operating, safe, That is a necessity m/c for cooling forming. 4. This m/c is adopted rapid cooling forming pattern (EVA\PE) for cooling forming.